The medical system is failing women left, right, and centre. Over and over and over again. Medical advancement on Women’s health is slow going (I feel in direct correlation to how long it took society to even accept women as Doctors but that is a rant for another day…). Because of a failing system that leaves a majority of it’s population sick and tired with no help in sight other than invasive surgery and pumping us full of more and more hormones we, the caregivers of society, are left burnt out, exhausted, sick, and mad as hell about it. Now let’s add in that some Women then grow humans inside them and are sent on their merry way to carry around this 6-13lb thing who needs them every moment of every day while recovering from, what can be, a very traumatic experience and we get a society that is breaking down. But who? A Dr. who gives you 15 minutes of their time and a prescription on the way out the door? I get it. It is nearly impossible to get the medical system to pay attention to us on a good day, let alone after we push out a baby and the system is just like, ‘Well, you had a baby…’. Things haven’t been ‘right’ with me since I had my Little Dude. Now include the fact that we had been dealing with some focus and sensory issues with our kid and I just excused away EVERY SINGLE SIGN my body was giving me that something was WRONG. We ended up taking our Little Dude to an Osteopath to help him regulate his emotions and help him focus. Leah at RPM physiotherapy has been working WONDERS on our kid and I am grateful for her every day. During one of Sully’s sessions, Leah and I got to talking about my periods (because what else would you talk about 😉 ). And she was like, ‘I can help you with that! I want every woman to know that their periods don’t have to hurt!.” And I was like, ‘Great! Because I want every Mama to know that they don’t have to pee themselves and have back pain after having a baby!’. LADIES UNITE! So I booked an appointment with Leah for myself. Literally, the first time I was going to talk to someone about my own health issues since Sully was born. We spent 90 minutes talking about everything that has ever happened to my body, ever. So then an appointment with a Naturopath who I talked to for 90 minutes. And SUDDENLY, I felt heard! I had never spoken to a Dr. for more than 30 minutes. All of the sudden my symptoms were all being connected, not just treated individually. And I cried. Because I felt so silent for so long and like nobody took me seriously. Not only that, but my Naturopath and Osteopath were speaking to each other outside of my appointment times with each other to figure out where to go with me. They were actually communicating as a team! It was decided that I should get some preliminary blood tests done to get a better picture of what was going on. The results were shocking. Things I had NO IDEA that were going on in my body. The numbers were so out of whack that my Naturopath had to send me back to my Family Doctor for Ultrasounds and a Urinalysis. But this time I was armed with blood tests to be taken seriously. My Dr. was shocked by the results. The results from the Ultrasounds and Urinalysis were even more shocking. More blood tests were ordered. A cortisol test was ordered. And those numbers were shocking as well. 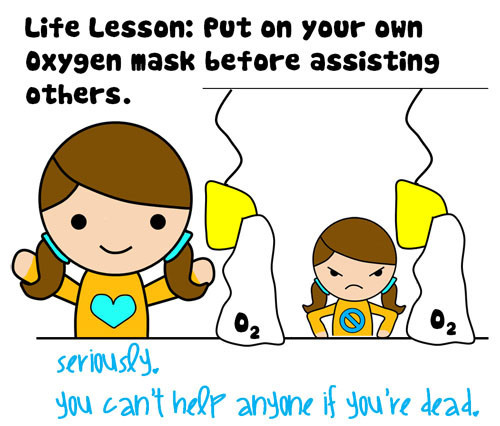 Since the moment my son was born, I have not put my own oxygen mask on first. I have ignored every single sign my body was giving me that she was dying inside. That I was neglecting her. That she needed help. And as Sully’s issues became more and more pressing and apparent, I pushed mine further and further down. It took a whole team of medical professionals to diagnose what was happening in my body. And I am mad as hell about it. I am mad at myself for ignoring my body. I am mad at a medical system where I had to HIRE a Dr. and pay for blood tests out of pocket in order to be taken seriously in our traditional system. I am mad that I have probably had PCOS since I was a teen but every medical Dr. just told me to take stronger and stronger pain killers or go on hormonal birth control. I am mad that my body is failing me and that I most likely won’t be able to have any more kids. I am mad there are more women out there going through what I am going through and more, but are just trying to live their freakin’ lives! Whatever that feeling you are having is (you know the one I am talking about), even though it may be common, it is NOT normal. Please please please don’t be like me. Listen to your gut. Trust your instincts. If you randomly have the feeling/thought like ‘Well, this can’t be right. This can’t just be my life/body now’, then go see someone. You need to know, above all else, that your body deserves love and respect and care. Use your voice. Advocate for your health. And if you go to a Dr. who doesn’t listen and just tries to shove a new prescription in your hand, find a new Dr., find a new modality, find a friend who can help you piece together a plan to get someone to listen to you. Because your body deserves to be listened to. And for love of everything, please please please put your oxygen mask on first.